Microgaming has produced some epic online slots over the years but Thunderstruck 2 has to be right up there with the very best of them. Thunderstruck 2 is a 5-reel 243 ways-to-win online slot that carries an RTP of 96.65% and a medium variance. Having been released way back in 2013, Thunderstruck 2 is still among the most played online slots at the online casinos. Why? Simply because Microgaming has once again created an online slot that is full of fantastic features, some excellent graphics and the playability to keep you interested for hours on end. Thunderstruck 2 is a sequel to the original online slot that they produced and this one has been loaded with additional features that will no doubt please the masses at the online casinos. What you will like the most about this online slot is that it increases your chances of big payouts the longer you play it and activate the game’s features. This makes it an excellent choice if you are ever planning to have an extended session of online gambling as you can really unlock some excellent benefits after a while. Thunderstruck 2 is a beautiful game to look at and while the graphics are a little dated compared to some of the more modern slots out there right now, they are still of a very good quality. Animations are about as smooth as you would expect from any Microgaming title and the soundtrack is relaxing enough to persuade you not to turn it off. Based on the ancient Greek gods, Thunderstruck 2 contains symbols such as Valhalla, Valkyrie, Loki, Odin and Thor for the better payouts on the reels. As for the low-paying symbols, these are the common playing card symbols that you will find in many online slots. Special bonus symbols on the reels are Thor’s hammer and the games logo which are the games wild and scatter symbols respectively. These symbols not only help you to bring in more wins on the reels but will also play a big part in the games main bonus features as well. The reels take up most of the screen but at the bottom, you have all the buttons you need to control the game. You can adjust the size of your bets, set the game to run automatically and check the games pay table from here. We recommend you take a quick look at that pay table, as you will want to become accustomed with the payouts that you could possibly land on the reels. When you get around to placing your bets, you will be able to 0.30 and 15.00 which is actually quite low. Despite this low max bet amount, you will still be able to pick up some pretty hefty wins when playing this online slot. The first interesting feature on Thunderstruck 2 is that of the Wildstorm feature which is activated randomly. Once this features kicks into action, a dark cloud will emerge above the reels. Lightening will then rain down before Thor will fill up between one and all five of the reels as a stacked wild. This can unlock some big wins and is always welcome when it occurs after you spin the reels. Easily the best bonus feature on Thunderstruck 2 is that of the Great Hall of Spins. 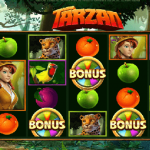 This is a feature that will give you more potential for payouts the more that you play in this online slot. For the first four times, you manage to unlock this feature you will be given a default ten free spins that have a 5x multiplier attached to any wins that they bring. As you unlock the feature more, however, you will be given further bonuses. Next five triggers give you 15 free spins, the addition of a Wild Magic symbol that appears on the middle reel and randomly turns into wild symbols. 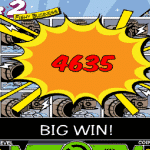 Furthermore, you can earn additional free spins should you land Thors hammers on the reels. Once you have activated this free spins round 10 times, the further five times will see you given 20 free spins. Additionally, you will also get to see the Raven feature that will randomly assign multipliers to selected symbols of 2x and 3x. If you are fortunate enough to have activated this round 15 times, every other time you activate it you will be given 25 free spins. On top of these, you will also have rolling reels that will increase a multiplier by 1x for every consecutive spin that you land on the reels. Just to top off this excellent free spins round, it can also be retriggered again during the round. As you can imagine, this free spins round is where most of the best payouts will come from and is the reason why this slot is still so popular to this day. There is a very good reason why Thunderstruck 2 is still such a popular online slot today and that is because it is an excellent release from Microgaming. It might not set the world alight in terms of graphics but it is the fabulous game features that allow this online slot to shine. The free spins round, in particular, is what most players will be aiming to unlock as much as possible. The fact that these features improve the more you play the game is also an excellent idea by Microgaming. The more you play the more chance you have of turning your online gambling session into a profitable one. If you are still not quite sure if you want to give this online shot a try, why not at least test it out by playing the free version? We are confident that once you have had a few spins and have seen the lucrative features in action, that you are going to be getting the wallet out and playing for some real cash.